Seventh- and eighth-grade girls of St. Elizabeth School in Paincourtville, dressed in white uniform shirts and pale blue skirts, the color of blue often associated with the mantle worn by the Blessed Virgin Mary, made their way to the front pews of St. Elizabeth Church. They were followed by their male classmates, who were dressed in khaki pants, white dress shirts and pale blue ties. Some of the students were holding the hands of much younger students, guiding them to pews in the front rows. It was a special day for this group of older students. They were being inducted into Sodality, an organization devoted to Mary. Among their duties, the group attends Mass every Friday dressed in their special uniforms and help with the younger students. They also lead prayer services and devotionals and organize the charity project for Catholic Schools Week. In addition to required service hours for their school, they must also perform five hours of community service every nine weeks and attend community events such as the Blue Mass honoring public safety employees. Every year, the Sodality induction is held at St. Elizabeth during a Friday Mass in May, the month of Mary. 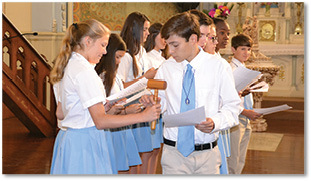 Eighth-grade Sodality officers pass the gavel to the seventh-grade incoming officers, who also make a pledge of honor. During the Mass on May 11, Noah Deshotel, the new prefect of Sodality, accepted the gavel from outgoing prefect Alyse Walker. Father Graham said he sees both leadership and spirituality growing among the members of Sodality as the students take on bigger roles. Because of schedule changes, Guillot will not teach religion next school year but plans to continue being the sponsor for Sodality as a tribute to her mother who died 11 years ago. Sodality members for the 2017-18 school year are eighth-grade students Alyssa Bailey, Haley Castro, Logan Falsetta, Lindsey Gros, Tyler Gros, Alex Hood, Sadie Jacobs, Rylie Klack, Abby Landry, Adley Mury, Emily Pilley, Saniya Prean, Darrius Thomas, Sherman Verner and Alyse Walker. Seventh-grade members are Alexander Blanchard, Maddex Blanchard, Noah Deshotel, Candan Herbert, Sanai’ja Horton, Annamarie Mabile, Makayla McKinney, Khai Prean, Owen Rives, Breana Sanchez and Sara Solomon.